Carnation centerpiece ideas are simple and fun. Using carnations for your wedding is an economical and safe option because you will be able to find these flowers practically year-round. Greeks and Romans used these lovely flowers as a sign of distinction. 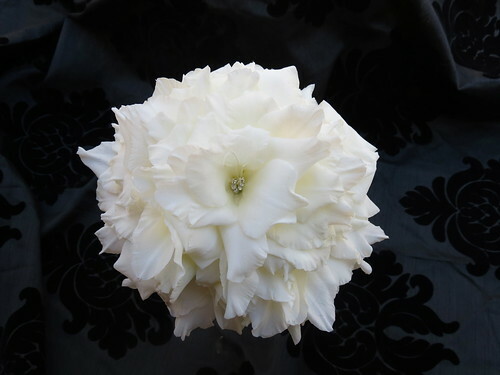 White symbolizes innocence and purity, making them a great choice for a wedding. Take a look at this lovely and simple table centerpiece. It is made with a single flower vase, some colored water, beads, and a carnation. You can make your own version of this arrangement using decorative crystalline sand, fake crystals, or pebbles instead of the beads. If you are having a 1950s, carnival or movie theme wedding, this unique arrangement may be ideal for you. The whole idea is to recreate a sundae by using pink and white carnations, a straw, a heart shaped cookie and a cherry on top. This is very original, and easy to make for DIY brides. Get your creative juices flowing and make a wonderful table arrangement of your own. You could also have a ball like carnation arrangement or centerpiece. Placing it on top of a high vase will help you create a tall table centerpiece and focal point. Carnations come in many different colors sure to match your wedding palette and celebration style.